In 1974, philosopher Thomas Nagel famously asked “What Is it Like to be a Bat?” Nagel rejected reductionism, the idea that all consciousness can be reduced to simpler components identical for all sentient beings. Instead, he held that for each type of conscious being, there is a unique mindset embodying what it feels like to be that type of being. These subjective experiences are called the “qualia” of consciousness, the internal viewpoints inherent to a sentient creature. Nobody can say what the qualia of a bat are, but I am here to analyze a closely related question: what are the qualia of a liberal? By liberal, I do not mean classical liberal, or even the American moderate Left that until the 1960s was ascendant in the Democratic Party. Rather, I mean left-liberal, or progressive, the ideology of cultural Marxism, of the Frankfurt School, now dominant in the Democratic Party, as it has been dominant for some time in the academic world and in other worlds controlled by the Left, such as the media-entertainment complex. What goes on behind their eyes? To a neutral observer, the externally visible political actions of today’s liberals are irrational and incoherent. The simplest explanation for their behavior is that liberals are people of low intelligence, and that they are not educated (whatever degrees they may have). An alternative simple explanation is that they desire evil and hide that desire, so their actions and stated reasons do not match. But, while both are possible explanations, it seems unlikely that that any of this is how they perceive the world and their actions. So again—what are the qualia of a liberal? We should be clear that specific policy prescriptions are not examples of qualia. For example, demanding gun control every time there is a shooting, or demanding gun control in general, despite the demonstrable total irrationality of using that policy prescription to fix the problems liberals claim it will fix, is not an example of qualia. Nor are the ever-increasing Left demands for censorship of views that oppose theirs. These are only the external appearances resulting from internal phenomena—equivalent to a bat turning in the air upon echolocating a mosquito to eat. The deeper question is what is the bat thinking upon making the turn? He is trying to achieve a goal, but what mental visions impel that effort? Upon this question, and similar ones, translated to the liberal brain, much turns, for if we can understand, even a little, we can more effectively combat their poison. This question of liberal qualia first occurred to me when listening to a new podcast put out by the New York Times, called “The Argument.” Having listened to three episodes, it has become clear that this podcast alone provides all I need to complete my analysis. I conclude that liberals have four key qualia, ones unique to liberals, compared to normal human beings. I note, by the way, that all human beings share most of their qualia. The first quale is that liberals do not see reality as it is. What their eyes perceive is not the truth, because everything is filtered through an ideological lens, which removes anything that contradicts their ideology before it can enter their minds. Reality is totally subordinated to political ends, which are derived purely from abstractions. Unlike a bat’s echolocation, this is not merely a different way of seeing the world. It is an inferior, neutered, way of seeing the world. If a bat could not see the world accurately, it would starve. Liberals are able to avoid such consequences, the hammer blows of reality, because in America today they live in bubbles of their own creation in which everyone else believes the same thing, in which they are never exposed to the consequences of reality and where everyone whose opinion they care about acts as if unreality is real. Critically, in those bubbles, liberals also control the levers of power, and of reward and punishment. In this walled ecosystem, they do not starve, because food is stolen for them from those who can produce value because they see reality clearly. Liberals are thus like the Old Bolshevik, Rubashov, in Arthur Koestler’s Darkness at Noon, who, on his way to be shot after conviction for crimes he knows to be wholly imaginary, truly believes that his execution is necessary and correct, since the Party is always right, history dictates that his death is required, and through this lie the Promised Land will be achieved. Even as the bullet enters his skull, Rubashov cannot free himself of the prison his mind has created for him, and so it is for liberals today—except that the rest of us, not them, suffer and die for their distorted vision of reality. These words are used because liberals know that anything not in agreement with them is bad, and they know that the words “corrupt” or “illegitimate” designate bad things. But corruption is objectively defined, Webster’s says, as “dishonest or fraudulent conduct by those in power, typically involving bribery.” (Or, more broadly, corruption means that someone with power claims to be performing a defined, neutral, role, and is instead performing a different, self-interested, one). Illegitimate means “not authorized by the law; not in accordance with accepted standards or rules.” Liberals’ complaint about Trump has nothing to do with those meanings. Instead, the words have been redefined to mean “nebulously very bad, in a way I need not explain.” In practice, this is a rhetorical device, what Scott Adams calls “linguistic kill shots.” Critically, though, in liberals’ own minds the meanings have not changed. The third quale, again related but distinct, is emotivism ruling rationality. Any matter perceived by a liberal that affects his political worldview is not analyzed objectively, nor are his conclusions supported logically, but rather with unbridled emotion. Occasional efforts at rationality are made, but upon any examination or challenge, emotion swamps any such attempt. Why? Well, we can’t really tell directly, of course, but this phenomenon seems to let the liberal avoid the consequences of denying reality, to serve to indicate tribal affiliation to other liberals, and to signal virtue and righteousness to the world at large, as well as to the liberal himself. Emotivism often appears as projection in the service of self-exculpation, used by liberals to whip themselves up into a righteous rage and justify ever more vicious attacks on those who stand in the way of their utopian political goals. The fourth quale is breathtaking arrogance, blended with a nebulous, yet unshakeable, conviction of their own moral superiority, both tied to the belief that history is a wave and liberals are destined to ride it like the Silver Surfer. The origin of this is not anything rational, such as an analysis of the past and measured predictions about the future, but an insatiable desire to lord it over supposed inferiors, feeding the human desire to feel that one is on a higher plane than others. This characteristic is often the most evident in particular political discussions, such as those surrounding global warming. It is reinforced, as with the anti-reality quale, by liberals’ living in a walled ecosystem, where they can daily reassure each other that yes, indeed, we are superior. And it often comes out in the visceral belief that anyone who disagrees with them is evil, since that belief allows feeling superior without any need to demonstrate superiority. It might also be objected these are not true qualia, since they are ideologically driven distortions of mental processes, not purely organic products of the brain. True enough, though it’s not clear that the ideology came first. Just as likely, some defect in the liberal mind resulted in them believing this way, and that same defect reinforces the qualia driving specific political demands. As Jonathan Haidt has noted, morality derives largely from pre-existent mental states; so (probably) with liberal qualia, although we will never truly know, since normal people cannot get inside the liberal mind, and if we are liberal, we lack the ability to self-analyze in this fashion. Finally, this analysis is not without its dangers. One logical progression of identifying the mental defects of one’s political opponents is to view them less than human, a path that has led to disaster ever since the French Revolution. That path is primarily one the Left has trodden, and in recent times, they have increasingly become unrestrained about wanting to step onto it in America. But the same temptation can occur on the Right. We should be careful that understanding the liberal mind is used as a tool to combat their political program, and to strip them of power, forever, but not to dehumanize them. The podcast features three regular New York Times columnists, Ross Douthat, Michelle Goldberg and David Leonhardt. Douthat is the only conservative who writes for the NYT and he is very conservative, although also very much infected by inside-the-Beltway thinking (which he admits). Goldberg and Leonhardt are very far left. Goldberg is farther left; that the newspaper thinks that Leonhardt can be the centrist in this trio is charming. But it isn’t surprising—every other person who writes for the NYT is also very far left, except for house “conservative” David Brooks, since the paper has reimagined itself as a full-time organ of attack upon Trump and anyone right of center, providing a safe space bubble for its clueless readers to imagine that they have the moral high ground, while reminding them of the looming powers of those wishing to attack the Left. Whenever I read the NYT, to which I have to admit I subscribe, I often find it weirdly compelling, even hypnotizing, until I step back and realize that almost all articles are packed with demonstrable lies, both of commission and omission, and, perhaps more importantly, skilled writing is used to weave deliberate propaganda, of which Joseph Goebbels would be proud. Anyway, in the first episode, “Is the Supreme Court Broken?,” the three columnists did a good job of being civil. All three are well-informed. But a good part of what Goldberg especially, and Leonhardt as well, said was quite literally insane and utterly divorced from reality, which made me think of bats as an explanation—maybe she just sees things in a way normal humans don’t. Despite appearances, I don’t think Goldberg is a mental defective. Instead, she is an outstanding illustration of the externally visible results of liberal qualia, as is Leonhardt, to a somewhat lesser degree. Again, no attempt is made to demonstrate this in even the slightest way, because the assertion is self-evidently ludicrous—it is more pure unreality and emotivism, as shown by the dead giveaway verb “feels,” along with more redefinitions. Goldberg jumps in to endorse shrinking or expanding the Supreme Court to pack it with liberals, rejecting that the possibility that will lead to a downward spiral of reaction and counter-reaction. So, decades of rule by the Supreme Court in favor of the Left and in opposition to democracy may be ending, though no court ruling has been made yet, but the Apocalypse has arrived. Again, we see three of the four liberal qualia (this time, we are missing word re-definitions, but we have unreality, emotivism, and claimed moral superiority). Leonhardt chimes in to say that despite “this enraging moment,” “the right answer is for Democrats and progressives to continue pointing out the ways in which this Court is illegitimate.” And here we have my original example, of redefinition of “corrupt” and “illegitimate.” In no plausible universe does either of these words apply to the Supreme Court as currently constituted (which Court, as I say, has not issued a single ruling). We see here all four qualia. “Humble” is redefined to mean “subservient to liberal goals.” When the Left spends decades remaking America, that is justice; when the possibility arises that the Right may reverse some of these Left gains, they need to be subservient instead, because that is “better for the country”—i.e., better for the Left. We also see here bizarre claims of moral superiority, akin to the man who, having killed his parents, throws himself on the judge’s mercy as an orphan. No acknowledgement is made of the hatred and confusion engendered purely by leftist attacks on Kavanaugh by obvious liars and perjurers, whipped up in organized fashion. Their purity is unassailable; their opponents, by merely defending themselves from slander, are “sinister” and trying to achieve “the breakdown of the rule of law.” All this in just a few sentences—and note that nowhere in any of these podcasts can Douthat be even once accused of exemplifying any of the four liberal qualia. On the surface, this is a mirror image of conservative complaints about their enemies. Maybe conservatives just live in their own bubbles, a topic I am going to address in a different analysis. But poke a little, and it’s not just ludicrously unmoored from reality, but malevolently so. Does anyone actually believe that Goldberg is ever “scared and afraid and humiliated”? Is she attacked when she goes to restaurants or in public places? Might she lose her job if she says something liberal? Might her children be ostracized by some political position she takes? Do people in power that she cares about treat her with contempt? Of course not. Those things only happen to conservatives, every day, to millions of them. Never to liberals, and most especially never to powerful liberals like her. But that’s not what Goldberg sees, and that’s my point. What Goldberg actually objects to, even if it is hidden from her, is that she may not be on top anymore; she may no longer be able to dish out contempt and humiliation to conservatives, forcing them to accept her radical political programs, because they may succeed in neutering a chief method of liberal power. That’s why they are her enemies—because the peasants are revolting and trying to throw off the liberal yoke and whip, not because they are actually causing her any type of harm. Filtered through the four liberal qualia, though, Goldberg sees herself as the persecuted, yet resilient and ultimately triumphant, Angel of Justice, pure in thought and deed. And in the same podcast, in addition to continuing to use “corruption” and “illegitimate” with redefined meanings, both Goldberg and Leonhardt repeatedly, more than twenty times, refer to the Republican Party using “damaged,” “broken,” “beyond repair,” “fundamentally sick,” and similar terms. They never say once what they mean by that; they treat it as obvious. But it’s transparently not a normal use of those terms—when one refers to something as “broken,” that means it cannot perform its function. In the case of a political party, its function is to gain power for its adherents. By that measure, the Republican Party is very much not broken, and no case can be made that it is. No, what they mean is a complete inversion of the actual meaning of “broken”—they mean that the Republican Party is effective and dominant, and eroding the power of their own political party. Once Leonhardt reverts, and says the Republicans are “doing so much damage,” which is an accurate phrasing. That reversion unveils the redefinition, of course. It’s not just this podcast series, of course—it’s most liberal pronouncements today. Take, for example, a piece that the famous Holocaust historian Christopher Browning wrote a few weeks back in that liberal bastion, the New York Review of Books, shrieking that Trump is Hitler (and tacking on that it doesn’t matter, since global warming is going to kill us all). Unfortunately for him, his writing totally beclowns him, and ruins his reputation. He, however, does not and cannot see that, for he has the qualia of a liberal (and lives and breathes in the walled garden of liberalism). But his pieces jarringly illustrates all four characteristics of liberal qualia, as you will see for yourself if you subject yourself to the link. I won’t go into detail, since this analysis is long enough, and dead horses should not be beaten, but I’m happy to discuss further if there is demand from the People! Charles is a business owner and operator, in manufacturing, and a recovering big firm M&A lawyer. He runs the blog, The Worthy House. 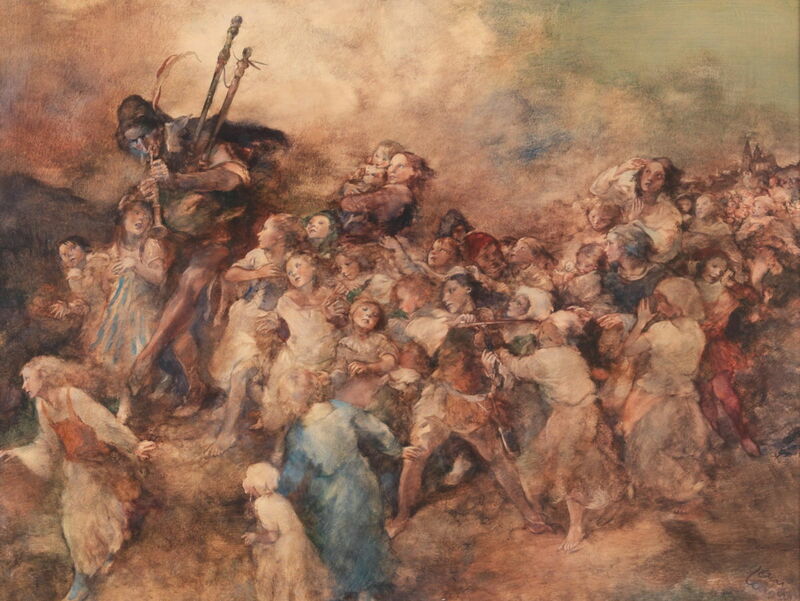 The photo shows, “The Pied Piper of Hamelin (Rattfaengler) by Oskar Larsen, painted in 1936. In today’s world, discussion about morals is a lost art. In part, this is because stupidity is on display everywhere, and encouraged to be so, even though most people’s thoughts and opinions are less than worthless, as a glance at Facebook or The New York Times comment sections will tell you. More deeply, it’s because America is dominated today by the nearly universal (but wholly unexamined) belief that the only legitimate principle of moral judgment is John Stuart Mill’s “harm principle” – that no restriction on human action can be justified other than to prevent harm to another. The Righteous Mind is an extended attack on the usefulness of the harm principle as the sole way to understand and justify human morality, combined with detailed explanations of the much broader ways in which people can and do view morality. 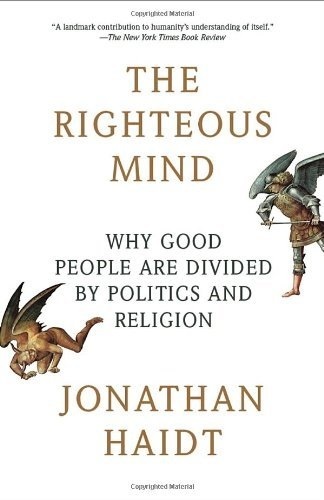 The author, Jonathan Haidt, uses this framework to understand political differences, and to plead for an increase in rationality and civility to arise from that understanding. I am not hopeful such an increase will happen. But this book is fascinating beyond belief. For a relatively short book, it packs in a tremendous amount of insight. It is therefore difficult to review or summarize; I could spend pages discussing relatively minor matters covered in the book. Haidt has that talent which eludes other science writers such as Steven Pinker – the ability to condense complex material without losing impact. The result is a work well worth reading. The book is divided into three main parts. The first and third deal with how humans engage in moral reasoning, and how that affects politics. The middle part deals with, in essence, evolutionary psychology—how humans became as we are now in regard to morality, and what that implies for us today. Haidt uses the metaphor of an elephant (intuition) and rider (reason) – mostly, the rider does what the elephant says, although sometimes the rider can guide the elephant, or at least influence him. He begins with a captivating review of how moral psychology has been studied and viewed by academics over the past few decades. This theory believed that as children become able to see the world as others saw it, they come to understand that fairness is everything, and build their morality around metrics of equal treatment. Moreover, as Elliot Turiel showed, children can differentiate between arbitrary and universal rules, nearly always believing that harm to others is wrong regardless of what is dictated by formal rules. As Haidt notes, these researchers’ conclusion, that morality’s chief aim is reducing harm and creating fairness, and that any other moral judgment is imposed arbitrarily from without by societies and cultures, dovetailed precisely with the then-rising American liberal (i.e., progressive) consensus, of maximizing personal freedom without limitation or end. This further reinforced its accuracy in the minds of its investigators, because it fit with what they personally believed. But this science was all wrong. These researchers fell into the trap of believing that because American children, and certain groups of Americans they studied, based their morality on fairness and non-harm, all others also did so. Haidt relates how he personally started with the same beliefs that were popular at the time (in the 1990s), but when he started reading Richard Shweder, an expert in Indian moral psychology, and went to India for some time, immersing himself in the culture in a non-judgmental way, he began to understand that people there viewed the world very, very differently. Harm in this view is not irrelevant, nor is fairness, but they are far from the most important consideration, whereas in an individualistic culture, where society cannot make any non-harm based demands on its individual members, it is the only thing that matters. Individualism basically came on the scene during the Enlightenment and only in the West; the rest of the world is still primarily sociocentric. Beginning to see this, Haidt spent the next years conducting ever larger studies, among a variety of cultures and classes, to see what the moral views were of people in hypothetical scenarios, some of which involved harm, and some of which involved other possible moral principles, such as loyalty and purity. He began to realize that it is simply false that children create morality for themselves out of the harm principle; instead, they have certain innate impulses, which are guided and enhanced by learning from the culture in which they grow up. There are many more innate impulses than mere avoidance of harm to others (which is also innate, not formed by rational thinking, contrary to Piaget and Kohlberg) and there is a complex relationship between those impulses and culture. Haidt then turns back to a history lesson, starting with Plato’s Timaeus and looking at various ways we have viewed the relationship among mind, reason, and morality. He discusses Hume, Jefferson, and most importantly for his book, Darwin. Haidt notes how in the mid-twentieth century, the idea that there was any native, or inherent, element to human nature became toxic, leading to the demand that all right thinking people reject that human nature exists, with the necessary conclusion that morality is purely the result of reasoning, with no innate component. He discusses how ideology was used to suppress those who thought otherwise, such as Edward O. Wilson, excoriated for daring to challenge the scientific consensus, but rehabilitated today. Over time, as evidence built up to the contrary, this monolith eroded, and an inherent human nature became recognized (though it is still denied in some quarters). It is important to realize that intuitions are not irrational, they are a type of cognition, not inherently of less worth than abstract reasoning. And, most critically, if you want to convince others you have to address their intuitions, not their reasoning, since the former comes first, and for the most part trying to address their reasoning is like addressing the rider where the elephant is actually in control. In fact, people who don’t make moral judgments this way, who instead use pure reason, are psychopaths, incapable of normal human interaction. (Almost all psychopaths are men, Haidt mentions – throughout the book, although he does not emphasize it, it is obvious that Haidt views men and women as far from interchangeable, probably for the evolutionary reasons he stresses in other contexts). Finally, in this section, Haidt demonstrates through the results of experiments that many of the reasons we state for believing as we do are social in nature – designed to enhance our popularity, justify ourselves to others, justify ourselves to ourselves, engage in confirmation bias, and, critically, find reasons that result in actions benefiting not just us but our group—all just like a politician, although here Haidt is not making specific political claims. Our stated reasons are largely manufactured to accomplish these goals after we have already concluded our moral judgments. This implies, among other things, that we cannot get good behavior by rationalism; that philosopher kings are not going to be more moral than anyone else; and that teaching ethics is worthless (which I have long believed, so I am sure Haidt is correct) – we should instead be conditioning intuitions. Haidt’s objection is not that the harm principle, in particular, is unjust or wrong, but that any moral theory resting on a single principle is not in keeping with how people really view morality, and therefore both are largely useless as an explanation and overly constraining as a hortatory method. In other words, most people, and nearly all of the rest of the world, have totally different moral intuitions, and therefore moral concerns, from what we are told by the dominant voices in the West are universal intuitions and concerns. Again, it is hard to do justice to the incisive and insightful nature of this analysis. Suffice it to say that Haidt is correct, and once you view questions of morality, and of individuals’ views of morality, through this framework, rather than being confined in the straitjacket of mere harm and fairness, you understand what drives people much more than you did before. Haidt emphasizes that these six ways of viewing the world (and perhaps others) are innate – not in the sense of being wholly predetermined, but in the sense of being “organized in advance of experience” – a “first draft” inherent in each person when born. Those traits lead people along different paths, often reinforcing their inherent characteristics, though not always. He notes repeatedly how, as with so many claims later proven wrong, a scientific “consensus” insisted until the 1990s that each person was a blank slate, but that has been proven definitively false. All six foundations, Haidt believes, originated in evolutionary behaviors, which he identifies for each, but that does not make any one, or any set of them, more or less valid than another. Of course, as will be obvious upon a moment’s reflection, and as Haidt explains, liberals draw their conclusions by relying on only three of these foundations (care, fairness and liberty), and often only two (fairness easily gives way to liberty, if oppression is thought to be present). Haidt is himself liberal, and he admits his original personal response to these insights was to try to aggressively put them to use to help Democrats win elections (John Kerry’s election, to be specific). His concern, then and now, was that since most conservatives (he identifies libertarians as very closely allied to liberals in their moral judgments, so here and elsewhere he means Burkean conservatives) rely more-or-less equally on all six foundations, their appeal is broader than the liberal appeal, which only offers something to a subset of the population. Although he mentions Edmund Burke, Haidt’s exemplar of a conservative is not Burke. He also mentions other relevant thinkers, such as, Thomas Sowell (who invented the terminology of the “constrained vision” of human capacity, on which Haidt in part relies to characterize conservatives), and Robert Nisbet (the originator of modern conservative theories of community). But he relies on neither one. Instead, Haidt chooses someone more obscure – the turn-of-the-century French sociologist Emile Durkheim, the polar opposite of John Stuart Mill. Among other things, Durkheim believed in the centrality of the family and the critical importance of a society consisting of networked, overlapping groups, in which the individual as individual played little role. He is Haidt’s exemplar of a conservative, fully realized in the sense of relying on all six of Haidt’s foundations of moral judgment, and Durkheim reappears repeatedly in the second half of the book. While religion is the focus of a fair bit of discussion, it is all about the evolutionary value of religion. But the reader is left with the lurking feeling that much of what Haidt ascribes to evolutionary pressure, to the “first draft” of intuition, is in fact the latent Christianity that is the utterly dominant moral backdrop of the West, even now. It may be true, for example, that human beings have an innate sense that others should not be unduly harmed, or that oppression is bad. (Haidt ascribes these to the evolutionary motives of keeping children safe and “a response to adaptive challenge of living in small groups with individuals who would, if given the chance, dominate, bully, and constrain others”—but when weapons were developed, could be resisted). But our interpretation of our intuition, the second draft made after the first draft of intuition, flows purely from Christianity, and it is hard to distinguish where one ends and the other begins. To non-Christian cultures, for example, the Golden Rule is either unimportant or insane. Nobody has an innate urge to obey it. This suggests that Haidt’s project of reclaiming some agreement on moral issues through better understanding others is doomed, since if it is true that what understanding we have relies largely or wholly on latent Christianity, as that disappears what agreement we have is likely to disagree as well. As to the validity of Mill’s harm principle as the touchstone of moral judgment, we can do no better than examine the braying of progressive philosopher Martha Nussbaum. Although Haidt does not mention her, she is in many ways the anti-Haidt. A large part of her recent career has revolved around her exaltation of the harm principle as the sole valid method of moral judgment, and the rejection of disgust, or what she claims to be disgust, as well as sanctity, as invalid. She has become famous for this, mostly because her positions conveniently fit right into the Zeitgeist, in that she claims all traditional morality, especially sexual morality, is to be rejected in favor of total individual liberty, the holy of holies of modern progressivism. Although I have not read her 2010 book From Disgust to Humanity, by all accounts its reasoning is exactly what Haidt finds most disturbing, and most cluelessly narrow. Her book is an extended attack on any moral judgment that cannot be justified adequately to Nussbaum on the exclusive ground of Mill’s harm principle, and most especially on any moral judgment that depends in any way on a decision regarding sanctity or purity (i.e., in her mind, on moral judgments that are the opposite of “Humanity”). Nussbaum further discovers a Constitutional imperative to enshrine in law her beliefs and way of looking at morality, which would have surprised any American jurist prior to 1950, and something Haidt, with his plea to understand and value all the different bases for moral judgments, doubtless finds troubling. But that, of course, is why Nussbaum is so widely praised—she offers apparent intellectual cover for WEIRD individuals to write their preferences into law in a way that cannot be appealed and cannot be legislated against by the majority who still honor the morals of sanctity. But as Haidt shows, this is just the result of a parched inability to understand human beings, and a rejection of the cognitive function of intuition – which is why Nussbaum and her many allies are, though they don’t realize it, on the wrong side of history. The third part of the book focuses on why these intuitions developed from a Darwinian perspective, and in particular on “group selection” – behaviors in groups, especially moral behaviors, and why Haidt believes they developed, namely in order to confer evolutionary advantage on a group level. Haidt himself is an atheist, so this is in a sense an intra-atheist dispute. And his definition of religion, following Durkheim, is “a unified system of beliefs and practices relative to sacred things,” in order to create a community. This definition is broader than revealed religion, and could easily include, for example, the belief system of modern liberals and their institutions sometimes called the “clerisy” or the “Cathedral” – but that’s a topic for another day. Here also Haidt veers into brief discussions of evolutionary genetic change in the recent human past (he believes it can and did happen, and continues to happen, but avoids excessive exploration, presumably so as not to get into the disputes that have embroiled Gregory Clark and Nicholas Wade, although he cites the latter several times). As the reader can see, Haidt relies heavily on evolutionary explanations. I have always been skeptical of evolutionary explanations for human characteristics – as Haidt acknowledges, they often shade into “just so” stories. Even if these explanations are true, or largely true, Haidt’s six foundations of moral intuitions do not explain many related areas of human nature. For example, why do people seek transcendence? But perhaps explaining everything is too much to ask, and what Haidt does explain is plausible enough. Haidt’s ultimate evolutionary conclusion is that humans are a unique combination of mostly chimpanzee with a little bee – we are mostly self-interested individuals willing to form groups, but sometimes willing to be “ultrasocial” (his term for human eusociality) and make sacrifices for the group as a whole, in ways chimpanzees never would (apparently chimpanzees can’t even agree to carry a log together, not ever, or engage in any other behaviors Haidt calls “shared intentionality”). “We evolved to live in groups,” which implies that an ethic of extreme individuality, as the WEIRDs would run society, goes against the grain of human nature. Again, I am not doing justice to the volume of information and analysis contained in these pages, which manages to be both extremely dense and very readable, sweeping in everything from Aztec use of hallucinogens to Ralph Waldo Emerson. Haidt ends with a series of political analyses. He offers two conclusions unpalatable to liberals – that conservatives are stronger politically, because as noted above their political offerings resonate with the moral frames of more people, and that conservatives are mostly right in their approach to human nature and its political implications. Haidt says that liberals, in fact to their detriment, typically are unable to understand conservatives, because their own moral framework is relatively limited, such that they retreat, when confronted with incomprehensible opposing beliefs, into the belief that conservatives are inherently evil. For example, liberals are far less able than conservatives to take a survey of moral beliefs and successfully pretend to be of the other political persuasion; they totally fail to grasp how and why conservatives really think, to a much greater degree than conservatives of liberals. This is not without consequences. In fact, sometimes, as Haidt explicitly notes, liberals react to their incomprehension with the belief that conservatives should be “exterminated” – a belief not found among conservatives about liberals. (Apparently conservatives are wise to keep buying guns). In his point-counterpoint, it’s conservatives who have something to offer everyone, and liberals/libertarians who have a pinched, unproductive, unrealistic view of the world. Thus, he calls for understanding opposing viewpoints, but offers opposing viewpoints that are not opposite and equal. He says the “liberal wisdom” that conservatives should accept boils down to some regulation being good, and that corporations should be restrained. But conservatives would not much dispute those two modest propositions; many would applaud the latter, especially today. These are vastly broader propositions than modest regulation and corporate controls; they are entire visions of the good and human society, and if this is “conservative wisdom,” it is of massively greater import than the “liberal wisdom” Haidt offers. In other words, liberals erode, if not destroy, society. Two examples Haidt gives are liberal devastation of the African American family (as a result of the elimination of sanctity as a moral imperative) and increasing racism among Hispanics, resulting from pushing multicultural education (by over-exalting freedom from supposed oppression). Just like Mark Lilla, Haidt has no use at all for celebrations of multiculturalism and diversity, nor, presumably, for “inclusion” as that word is used today, the celebration of the abnormal and corrosive, and the violent suppression of the normal and traditional. To say that all this is wildly offensive to most of today’s American progressives would be a gross understatement. Of course, Haidt’s work opposes much conservative thought. He rejects the truth of both any religion and anything such as natural law – morality may be based on innate intuitions, and human nature exists, but that does not imply that there is a deeper law, much less a law set by God. Humans have no teleology; Darwin exists in a vacuum. Still, it would be valuable to try to apply Haidt’s framework to a variety of issues, though I won’t do so here. What of guns? Or global warming? Abortion, for example, can be viewed in different ways depending on the external information used to inform innate impulses. Thus, in any abortion debate, care/harm is a critical question – but whose? That of the unborn child? The mother? Both? In what proportion? Haidt, of course, doesn’t claim that his framework answers all moral questions – his claim is much more limited, that people approach moral questions in a definable way with certain common characteristics among all people, but with key differences as well, and that understanding this truth makes it possible both to discuss political matters with others and, up to a point, attempt to influence them in more productive ways than might otherwise be possible. Since he wrote this book, in 2012, Haidt has become perhaps the most prominent liberal voice today in America calling for both a concerted effort to increase civility in political discourse, by using the frames he presents in this book, and by also calling for the toleration of conservatives in the academic world. His linking of these things pretty clearly shows that he thinks that most narrow-mindedness, at least among elites, is on the liberal side. He has been thinking this for a while; this theme can be seen in his modestly famous keynote speech at the 2016 annual meeting of the American Psychological Association, and in his more recent founding of a group, Heterodox Academy, explicitly devoted to reducing ideological persecution of conservatives in the academic world. These are honorable and valuable goals, though I suspect the answer is “No, we can’t all get along,” and both Haidt’s analysis and events in the past six years support that answer. Just because people of good will want others with hugely divergent moral visions to see everybody’s point of view does not mean that those people can live together in harmony, or even peace. That’s too bad, but at least when we’re manning the barricades, if we’ve read this book, we’ll understand the people storming them better than we would have otherwise. 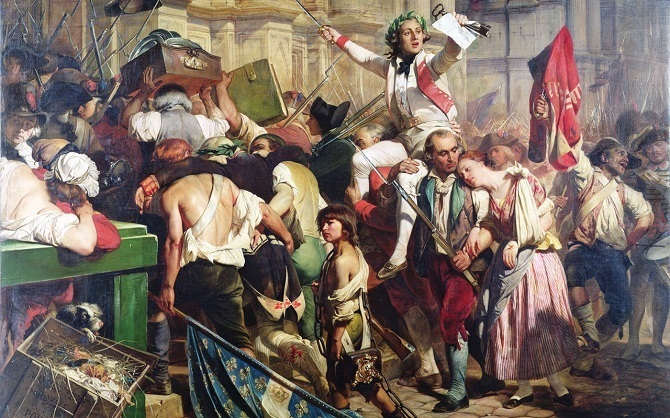 The photo shows, “The Conquerors of the Bastille in Front of the City Hall, 14 July 1789,” by Paul Delaroche, painted 1830-1838.